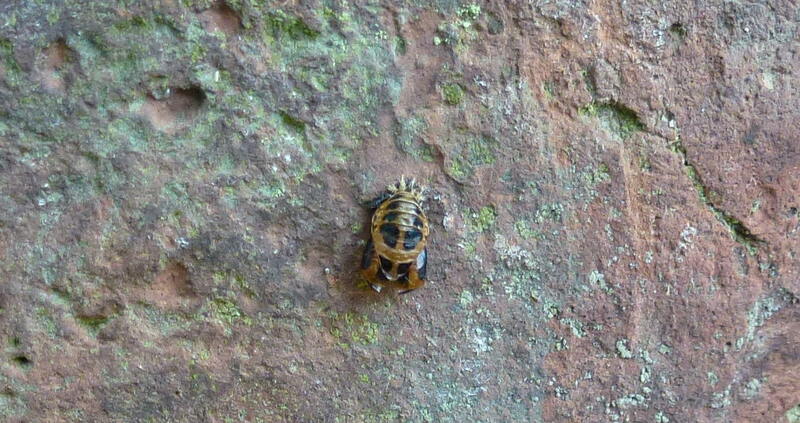 This is a harlequin ladybird crawling on a wall in the Midlands, UK. The succinea variety of harlequin ladybird…eating your greenfly since 2004. This sight is increasingly common place in the UK these days but prior to 2004 you would not have seen any. This is because the harlequin ladybird is a non native species that since it’s first sighting in 2004 has spread rapidly to become the UK’s most invasive species. They’re a striking looking insect and if you’re a gardener you’ll be pleased to hear that they like nothing more than to feast on greenfly just like our native species of ladybird. A spectabilis variety harlequin ladybird emerging from a pupae (to be honest it may not be it’s pupae at all, it could be planning to eat the contents of this pupae…they’re not fussy). But it’s not all good news especially for our native species of ladybird seven of which are thought to be in decline as a result of their invading cousin. The reason for this decline is thought to be the harlequin ladybird’s voracious appetite (that includes other ladybirds) and also due to diseases they’ve brought with them that affect our native species. This is the larvae of a harlequin ladybird pitching his spot on this sunny wall ready to pupate. The harlequin ladybird actually originates from eastern Asia where it can be found in many places including Russia, China, Japan, Mongolia and Taiwan. Their adaptability and ability to travel allowed them to gradually spread across Europe and are thought to have probably crossed the English Channel hidden in boxes of imported vegetables and flowers. This theory is backed up by the high numbers of these insects found in London around the markets that receive these imports. One of the interesting facts about harlequin ladybirds is that their markings can vary considerably. Shown here are the three main varieties of harlequin ladybird (left to right) succinea, conspicua and spectabilis. There are three main varieties, see the image above, although these colourations can vary considerably. Due to the negative impact of these insects and their potential to completely wipe out several of our native species there are organisations keeping track of this invader. 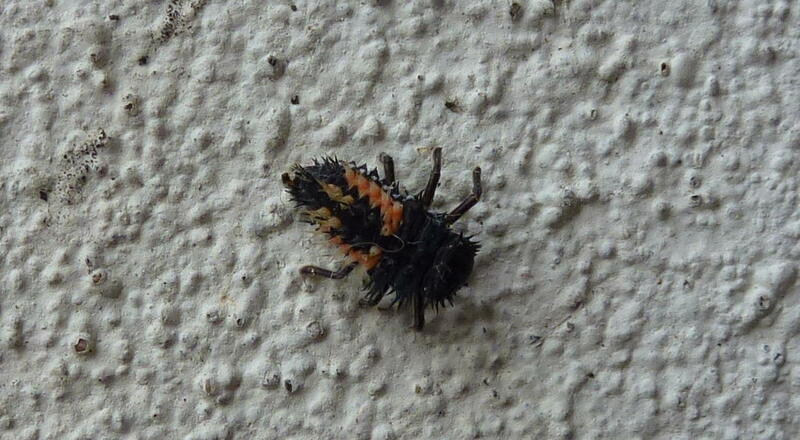 A harlequin ladybird pupae on a wall, this one looks empty now, the occupant is long gone. 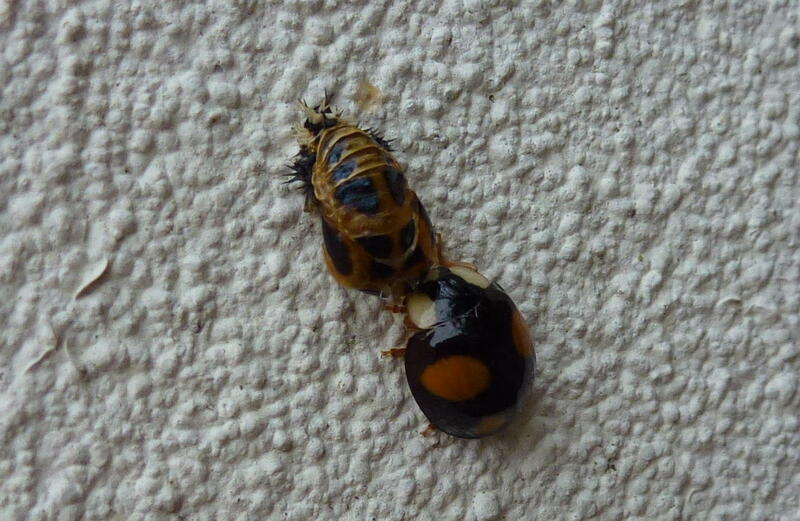 The question on your mind now is probably “should I squash harlequin ladybirds whenever I see them?”. We here at ENH try not to kill anything wherever possible and we’re not going to advise you one way or the other. Having said that the official line seems to be not to kill them for the simple reason that their varied colourations can often make them look like our own native species leading to cases of mistaken identity.